Unlike the majority of plants and trees you may be familiar with, most bamboo species seldom flower. The typical flowering interval can be decades long. Phyllostachys bambusoides, or Japanese Timber, has the longest know flowering interval at 130 years. It should be noted that some species of bamboo do flower annually, although this is not the norm. 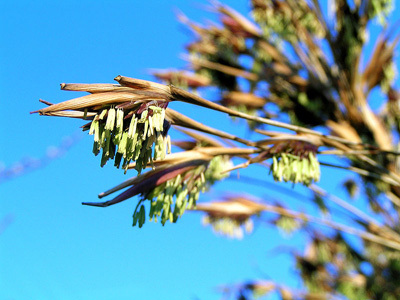 The long flowering intervals are largely a mystery to botanists and observers alike. This has been a topic of debate for centuries, and can be traced back to old scientific literature. Many theories have been presented, but none have given a definitive explanation to this unique flowering mechanism. Bamboo exhibits what is known as gregarious flowering, or mass flowering. All plants in a grove will flower simultaneously, regardless of outside conditions that may be present. 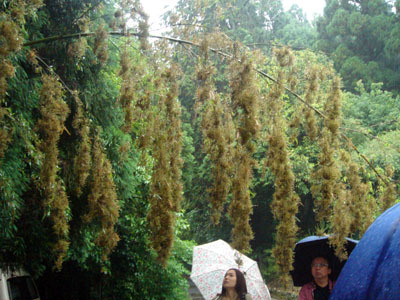 Neither climate, nor geographical location has an impact on the timing at which bamboo flowers. This mass flowering is likely connected with vegetative propagation, the way in which bamboo spreads both in the wild and in human cultivation. Propagation is typically conducted by splitting the rhizome of the plant and transplanting into a new location. This method essentially creates clone plants, as the genotype is identical to the domain plant. Timing is likely programmed into the plants genetic structure, causing all plants to flower within the exact same timeframe. It was previously believed that all bamboo plants belonging to a specific species would flower simultaneously worldwide. There have been many examples throughout history and in folklore of mass flowering of bamboo on a global scale. In some cases this has been observed, but it is generally accepted that not all plants of the same species will flower simultaneously worldwide. It is more likely a factor of the genetic source and age of the bamboo. The flowers themselves are less than spectacular to the average onlooker. Like most grasses, petals are absent from the flower and they lack the ability to attract insects through the use of nectaries. They are structured for maximum effectiveness with wind pollination. In many species, the bamboo will die after the flowering period. The plant focuses the entirety of its energy on flower production, with this being observed by a lack of leaf production. Over the course of the flowering period, the bamboo will rely on nutrients stored in the rhizomes and culms. This is not always the case, as some species continue to produce leaves in the spring, and flower in the summer. This will usually weaken the plant for a number of years, but a recovery will eventually be made.